Observed a regression issue in OSB 11.1.1.4 when we recently upgraded from version 11.1.1.3. The issue is that when the proxy service receives the error BEA-380001-Internal Server Error, the control is not going to proxy level service error handler. 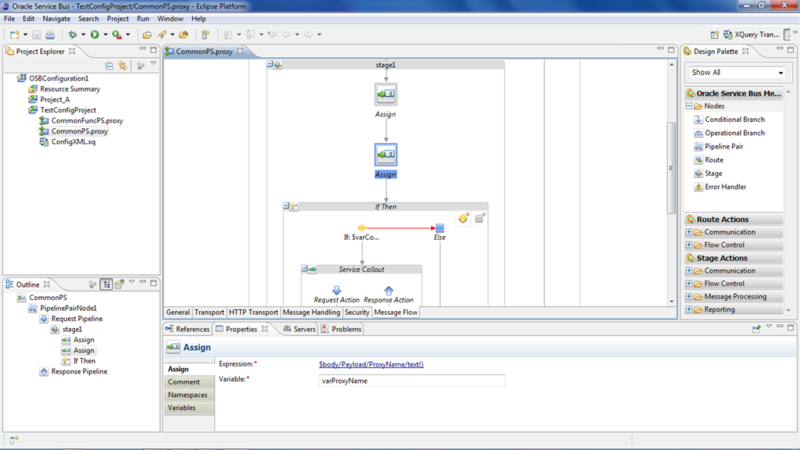 The message flow is only showing the system error handler which is unexpected. We are using the routing to call the business service. The issue is resolved by using the workaround of having error handler at routing level. No specific solution is provided by Oracle for the time being. Have not verified this issue in recent release of 11.1.1.5. In one of my proxies message flow, I have come across the following error with one of the assign activities, when I use the XSLT to do some processing on the payload. javax.xml.transform.TransformerException: com.sun.org.apache.xml.internal.utils.WrappedRuntimeException: Content is not allowed in prolog. When I add/delete a single character in the payload, the XSLT will work without any problem. I observed this issue in OSB 11.1.1.3 on Linux platform. – Rewriting the XSLT etc..etc..
None of the above options had really worked for my case. Finally found a patch#10086559 in oracle support site and applying this patch resolved the issue. Have seen the same issue in OSB 11.1.1.4 and resolved after the patch application. Have not verified this issue in recently released OSB 11.1.1.5. In 11.1.1.3, while creating the OSB domain we have the option of selecting ‘Single Server Domain Topology’ and ‘All Domain Topologies’ as shown below. These options will create single Admin server and Admin+OSB managed server respectively in the domain. 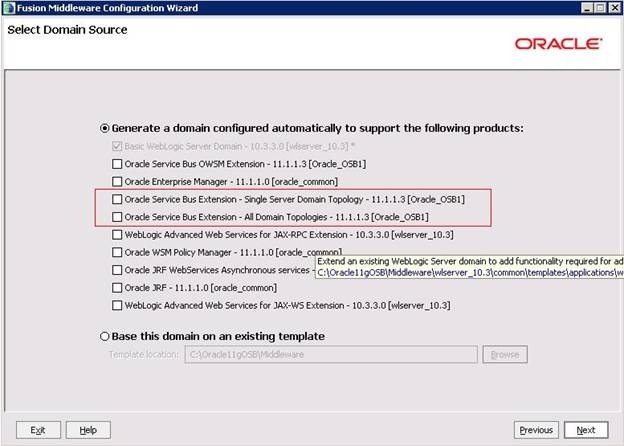 In 11.1.1.4, these options ‘Single Server Domain Topology’ and ‘All Domain Topologies’ are modified to ‘Oracle Service Bus for Developers’ and ‘Oracle Service Bus’ respectively as shown below. In the last post, we have seen that calling proxies send the proxy name as a payload to CommonPS as shown below. This approach has a problem that we have to manually change the ProxyName element in the payload every time we rename the proxy service. 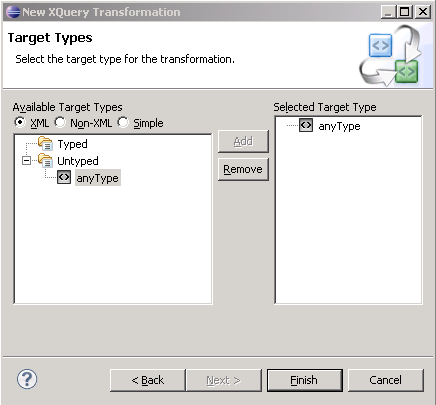 To overcome this problem we can use the XQuery expression $inbound/@name to get the proxy name. This would give the proxy name in the following format. So in PS_A, modify the assign activity that is present in the request pipeline as shown below. Using the expression $inbound/@name in the above payload will be converted into the following once it reaches the CommonPS. This triggers a change in the message flow of CommonPS as well. So modify the assign activity which is shown below with a new expression to get the proxy name. Modify the expression in this assign activity to the following. Now deploy both of the OSB projects(TestConfigProject and Project_A) and run PS_A and PS_B once by setting the Flag value as ‘Y’ and once with value ‘N’. Observe that the auditing is happening only when the Flag value is set to ‘Y’ as observed in earlier scenario. We often see the following scenarios in any typical software application development or deployment and OSB is also not an exception from this perspective. – There will be few things or parameters that have to be modified depending on the environment that we are deploying to. – Provision for switching on and off of the some functionality based on the requirement. For example, a service that logs some information into database should be configured to switch on and off when required. 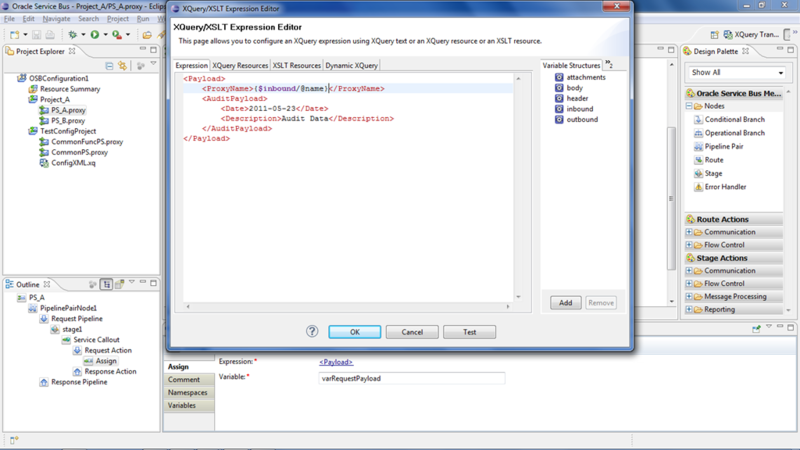 – Creating the XQuery Resource with configurable properties. 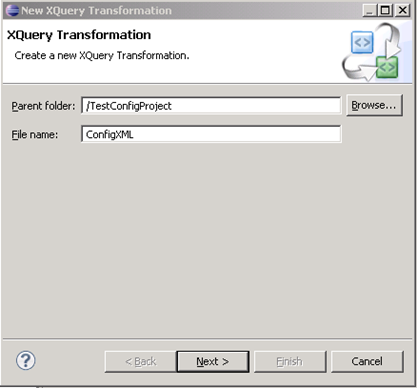 Create any OSB project (TestConfigProject), right click on the TestConfigProject and select New –> XQuery Transformation as shown below. Give the filename as ‘ConfigXML’ and click on Next. Select anytype, add it and click on Next. Again select anytype, add it and click on Finish. Following screen will appear after clicking on the ‘Finish’ button. Go to ‘Source’ tab on clicking and delete all the contents. 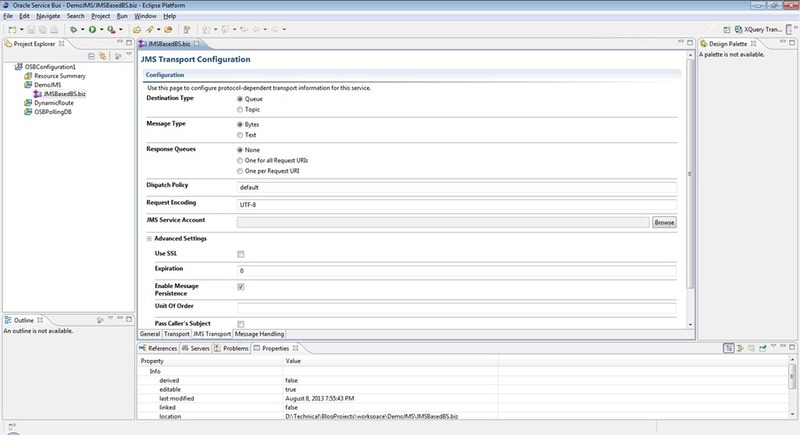 Assume that we want to specify the configurable property for each and every proxy service present in our OSB configuration project. So we could paste the following contents in our XQuery resource. This XML structure allows us to add as many properties we want for each proxy service. Consider a scenario where the proxies PS_A and PS_B have to call some other proxy CommonFuncPS which does the actual activity of inserting some auditing information in database. And this functionality should be configurable so that we can enable/disable the auditing whenever required. 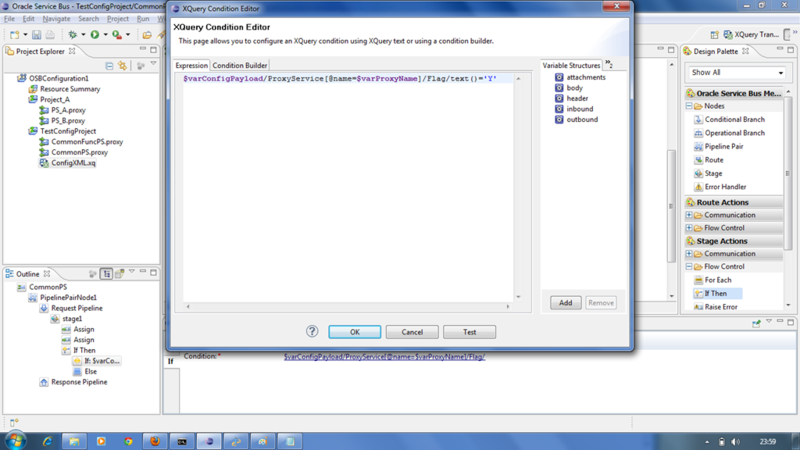 We can use the above XQuery resource for configuring this functionality. The flag value ’Ý’ indicates that the auditing should happen and the value ‘N’ indicates that auditing should not happen. To achieve this, let’s create another proxy service CommonPS that checks for this configuration property value and calls CommonFuncPS based on the value given in the XQuery resource. The following screenshot shows all the proxy services that are involved in this exercise and let’s create all proxy services as ‘Any XML Service’ for simplicity. 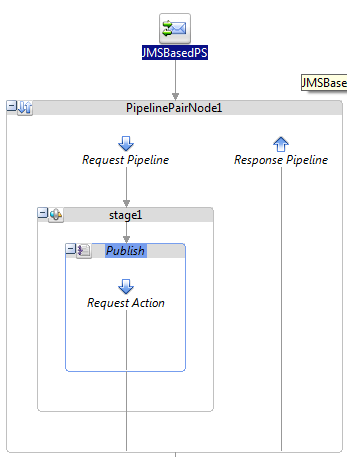 Go to the message flow of the proxy service and insert a pipelinepair Node and Stage and insert an assign activity. 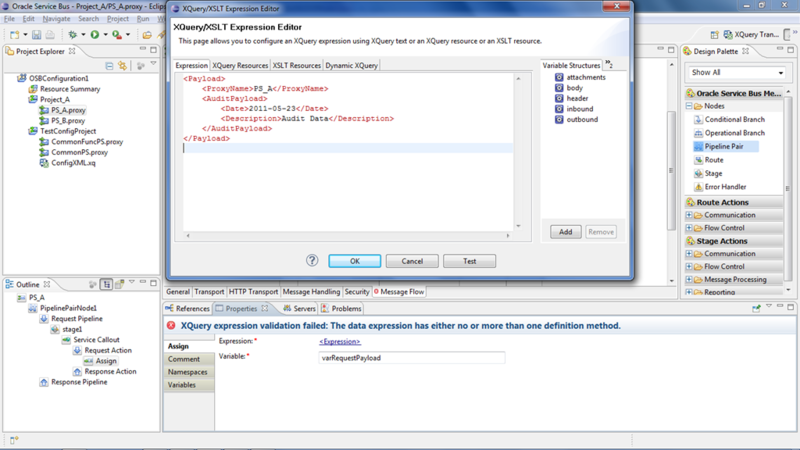 Click on the ’Éxpression’ in the properties and select XQuery resource as shown below. 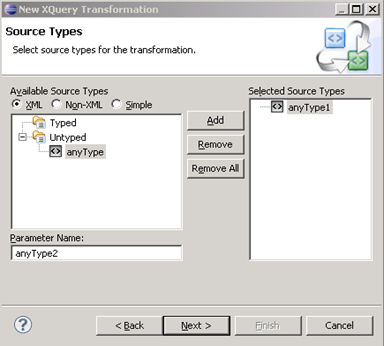 Select the XQuery resource by clicking on Browse button as shown below. 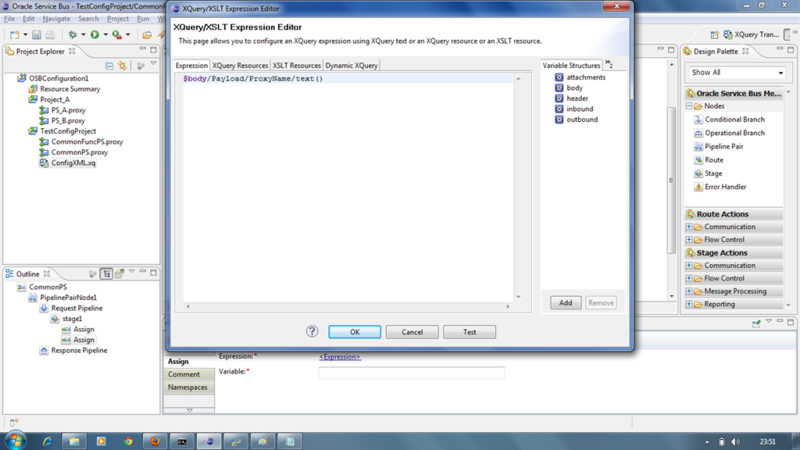 Click on OK button after selecting ConfigXML.xq resource in the popup window and give the assign variable as varConfigPayload. Create another assign activity to get the proxy name that is been passed in the input and use the expression as shown below and assign this value to a variable varProxyName. We have a variable where the configuration information is stored for all the proxies and also we have a variable which gives the information about calling proxy. Now we need to check whether audit flag is enabled or not before calling the CommonFuncPS. So insert If-Then activity from Stage Actions –> Flow Control as shown below. 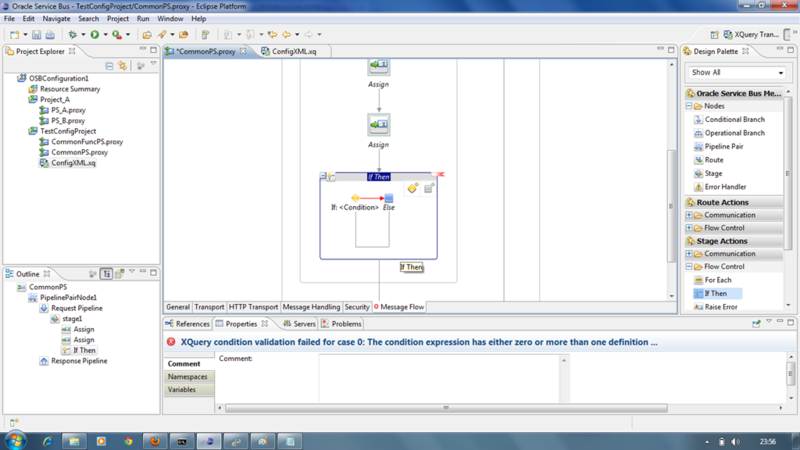 Enter the expression for if condition as shown below. 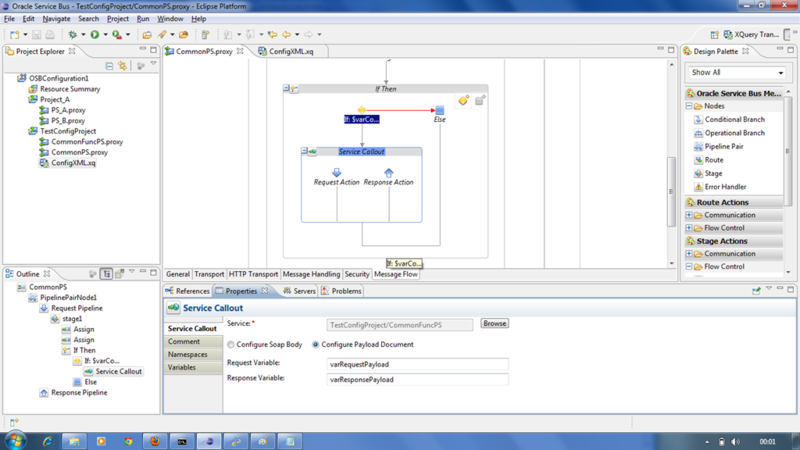 Now insert a service callout to call the CommonFuncPS and set the variables as shown below. Since this article is about the configurable properties we will not look at the actual message flow of CommonFuncPS. We have done with the message flow of CommonPS and we will see the message flow of the calling proxies. Calling proxies message flow is very simple which will have just service callout to CommonPS proxy service as shown below. 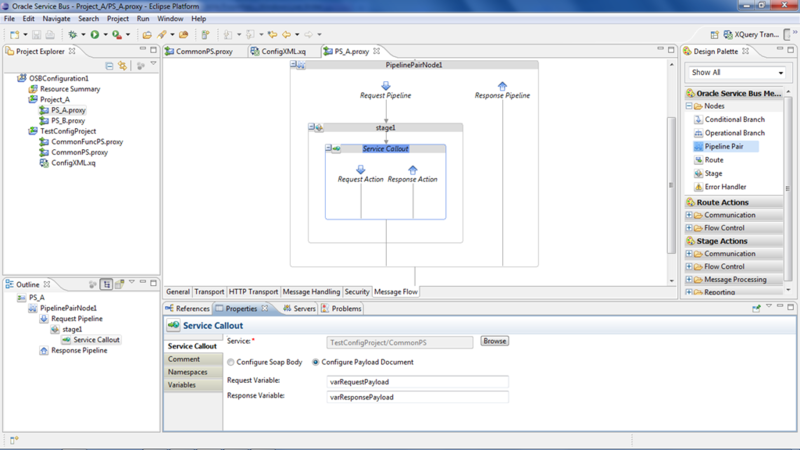 Insert an assign activity in the request pipeline to populate the request variable of above service callout and pass the actual proxy name for ProxyName element as shown below. Now deploy both of these OSB projects and run PS_A and PS_B once by setting the Flag value as ‘Y’ and once with value ‘N’. Observe that the auditing is happening only when the Flag value is set to ‘Y’. 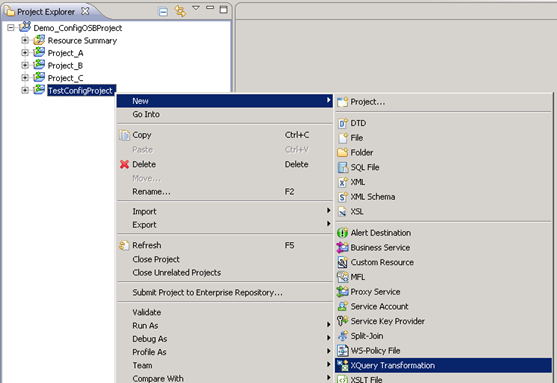 This way an XQuery resource can be used to define all the configurable properties for individual proxies existing in your OSB configuration project. The XML used in this demonstration is also extensible and number of properties can be added as and when required. In previous post, you have seen using the JMS transport in business service to enqueue messages into JMS queue. In this post, you will use JMS Transport in proxy service to read/poll messages from JMS queue. The OSB project used for demonstration can be downloaded from this link. Since DemoQueue has enqueued message (seen in previous post), you will read the same message using a proxy service and route it to another business service which enqueues into DemoQueue1. So create another JMS queue and required JMS resources and create new business service in similar fashion as described in previous post. Set endpoint URI to point to DemoQueue1. 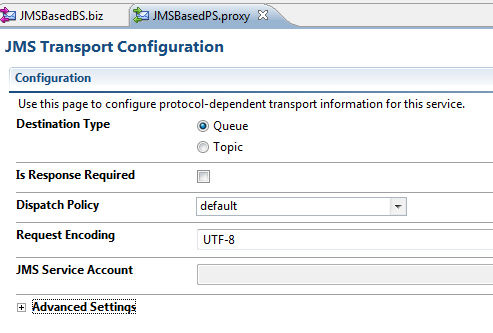 Create Proxy Service and select JMS as Transport Protocol. Set endpoint URI to point to DemoQueue and Connection Factory. Go to JMS Transport tab. Select Queue as destination type and uncheck Is Response Required as you are not expecting response from business service. Go to Message Flow tab. Drag Publish activity and select new business service in properties. The Publish activity is used for one-way communication and here it routes the JMS message to business service. 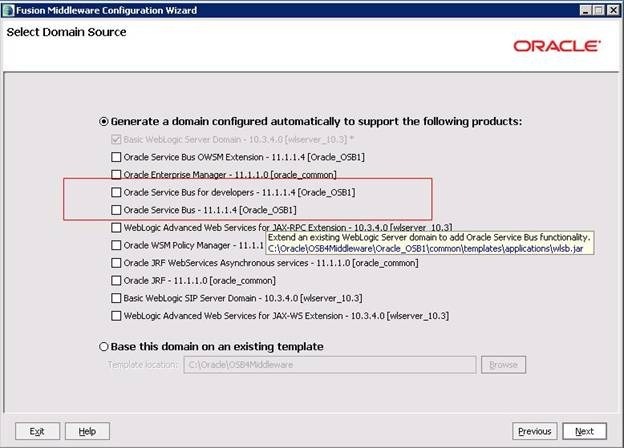 Deploy OSB project and observe that proxy service read the message from DemoQueue and enqueued into DemoQueue. Here your proxy service acts as a MDB that polls your JMS queue for the messages. We use JMS queues for reliable messaging or for asynchronous communication with other legacy systems or third party systems. The JMS queues can reside in local WLS or in remote server. Here, in this post we discuss about using JMS transport in OSB and demonstrates the same using queues in local WLS. You can refer to this link for more explanation on different JMS Resources. And the OSB project used for demonstration can be downloaded from this link. JMS queues are always referred in context of a Connection Factory, so you need to create Connection Factory first and then actual JMS queues. In OSB, JMS transport is used to either enqueue or read messages(poll) from JMS queues. To enqueue the messages, use JMS transport in business service and to poll/read messages from JMS queue, use JMS transport in proxy service. Open WLS Admin console and navigate to Home -> Messaging -> JMS Modules. Click ‘New’ to create new JMS module. Enter name for this new JMS module and click ‘Next’. Select all target servers and click Next. Click Finish and verify new JMS module has been created successfully. Now you can proceed to create Connection Factory and JMS Queue. Navigate to DemoJMSModule–> New and select Connection Factory. Click Next and give name for both Connection Factory and JNDI. Click Next. The target server will be selected automatically for connection factory. Click Finish. Click New and select type of resource as Queue. Click Next and give name for Queue and JNDI. Click Next and proceed to create new Sub Deployment. Provide name for this new sub deployment and click OK. Select an existing target JMS server and click Finish. Verify that JMS queue is created in DemoJMSModule. Create a XML based business service. If JNDI name has ‘/’, then it should be replaced with ‘.’, while specifying endpoint URI in business service. Navigate to JMS Transport tab. 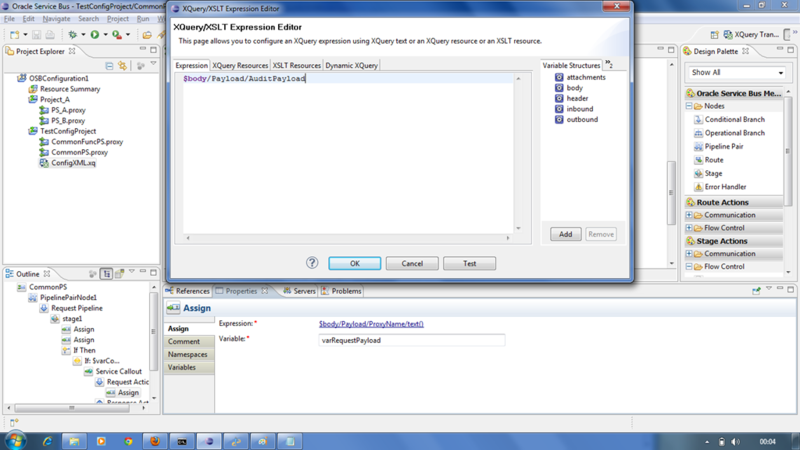 Select Queue as destination type, Text as message type and None as response queue. Now you are done with business service. 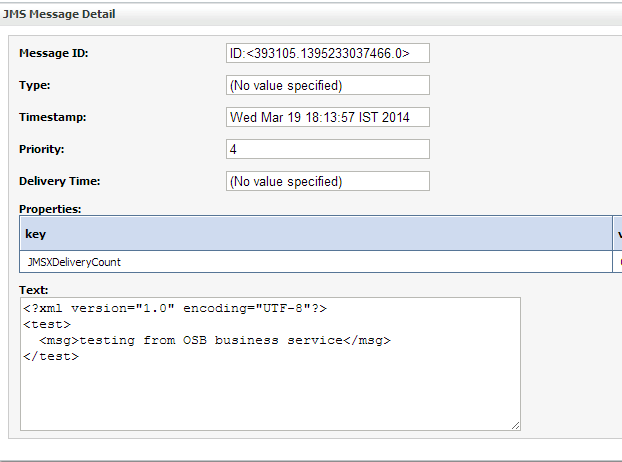 So deploy OSB project and test by giving any sample XML or text message in test console. To view messages in queue, navigate to Home->Messaging->JMS Modules-> DemoJMSModule->DemoQueue-> Monitoring. Select the queue and click on Show Messages to see all messages. Click on specific message to verify. "Test Console" service is not running.Contact Administrator to start this service. Go to the location $DOMAIN_HOME and in the file alsbdebug.xml file, make sure that value for following property is set to true. Once the value is modified to ‘true’ restart the osb server and try. Now test console should work without any issues.